Security awareness training is required for all faculty and staff. Beginning on Monday, Oct. 29, all faculty and staff will receive an invitation to Webster's Web-based Security Awareness Training. 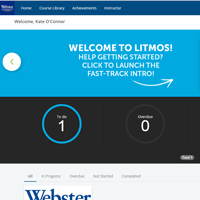 The invitation from Litmos will provide a link to the dashboard module for training. Users must use their Connections credentials to gain access to the training. This security awareness training is a Webster University initiative and a requirement for all faculty and staff to complete the training. At this time, there are four courses to complete, each with assessments at the end. However, note that some employees, based upon their role within the University, may be required to take additional courses for legal compliance (e.g. GDPR, PCI, GLBA). The University is committed to protecting personal and private information of our students, alumni, faculty and staff. Education and training on privacy and data security is key to upholding that commitment.